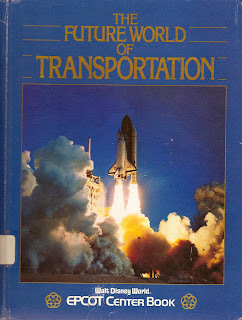 I remember checking out this book at my elementary school library and being fascinated with the prospect of futuristic transportation. In the second grade I even did a science project on "Cars in the Year 2000." (In 1992, the year 2000 still had some significance to a second grader.) My cars traveled on an electric grid throughout cities. Nowadays, my hope for the technology of the future mostly resides in ideas like wireless power and the prospect of setting up wireless power grids, much like the wireless internet infrastructure some cities are adopting. Chapter 1 of The Future World of Transportation opens with the ambitious "Report from the Year 2050." Their future is filled with "Ultra Jets" (described in the glossary as a double-decker plane of the future which loads passengers and cargo while hovering in the air) and "autoplanes" (a combination airplane and car) but, "there is still only one terminal for space flight, the Earth International Space Port near Tucson, Arizona [which is] used largely by people who have business on the satellite space stations, or 'space-habs' or by those going to one of the new space station resorts." The second chapter is basically an advertisement for the now defunct World of Motion ride at EPCOT Center in Walt Disney World while the third chapter explores the history of transportation from the invention of the wheel to "current" flight technology. The fourth chapter is called "Moving Ahead on Land" and starts getting into some great paleo-futuristic territory with the "Planetran, a sleek magnetic levitation train propelled by electromagnets, [that could] whisk passengers from New York to Los Angeles through underground tunnels in less than an hour." Now that's what I'm talking about. The fifth chapter explores "The Future at Sea" and basically guarantees the young readers that they will see three-wheeled land/sea vehicles powered by water jets in their lifetimes. The idea of their "floating hotel" is the most intriguing, as it appears that the hotel itself could, "move between ports on a cushion of air at 50 miles per hour." There appears to be no explanation necessary as to why someone would want a moving hotel in the paleo-future. Chapter six lays out the somewhat mundane history of speed on land, sea and in the air but gets into amazing paleo-futuristic territory with the demonstration of a WASP or Williams Aerial Systems Platform which, according to the glossary is "a one-person flying device that is powered by a small turbofan engine." Personal rocket packs, here we come. The book ends with a chapter called "Giant Steps into Space" which, as we all know, is the final frontier. Again, I can't help but wonder if any publisher could put out such an earnest and optimistic book for children today. The sincerity with which this book addresses the beautiful technology to come is astounding. Part of me laughs off everything in this book as fanciful and naive dreaming. Another part of me longs for that cynicism to be overtaken by hope for the future and the desire to again be amazed. Because, if the iPhone is the only thing that will revolutionize the way we live (as I believe on some level it will) we seem to be far from the "future" EPCOT sold us in 1982. This blog is Super-Toy Number One! Seriously, great idea. Just keep generating content and I'll be hopelessly devoted. I am a big fan of "futures" that never was and always thought I was the lonely one. I collect books about the future and just booked your blog and put it in my blog's links. I'm much older than you, but I have the same sort of memories of an issue of National Geographic from 1968 on the topic of future transportation. I'll try to dig up some pics from it. Hmm, that amazon URL got a little cut off, on my browser at least...anyway, the ISBN after the "ASIN" should be 0860202909. Also, you might want to check out the blog "World of Kane" at worldofkane.blogspot.com , it has a fair number of posts on retro-futuristic stuff along with other posts on design from the early 60s. Are these illustrations from the same Epcot publication? If that is the case then I think they're all adapted from Neil Ardley's series of books about the future from about 1980.